Oil stocks are getting windier -- but are these investments worthwhile or worthless? 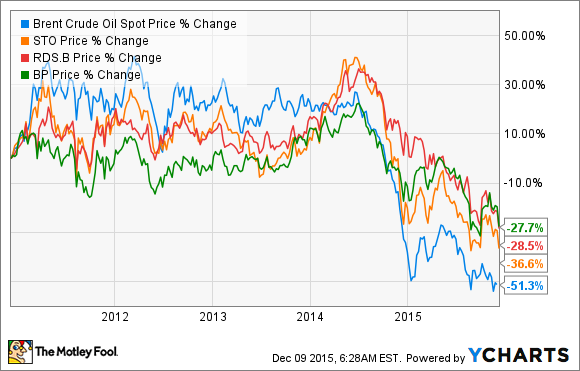 In the past five years, oil prices have dropped 50%, to around $40 a barrel. For some investors, that means that now is the perfect time to buy oil stocks that have suffered alongside the price of the base commodity. For other investors, this downfall is a signal of the end of oil. And for others, still, this half-decade of erratic oil symbolizes something entirely different: the ever-present need for diversification. The energy sector is historically comprised of some of the most undiversified companies on the stock market. Each finds its niche, digs out its figurative (or literal) competitive moat, and sticks to what it knows best. But all that is changing, and some oil companies are making efforts to diversify their own investment portfolios with alternative energies. Not all these investments are sincere, but some point to a level-headed identification of competitive advantages in the wind-energy world. Click through the slideshow below to see how BP p.l.c. (NYSE:BP), Royal Dutch Shell plc (NYSE:RDS-A) (NYSE:RDS-B), and Statoil ASA (NYSE:EQNR) are investing in wind energy -- and whether those investments are worthwhile or worthless. 3 Oil Companies Investing in Wind Energy from The Motley Fool.